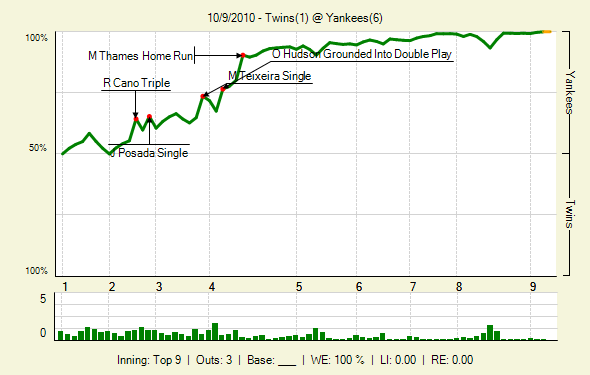 The only thing different about this one was that the Twins didn’t take an early lead. In their previous five postseason meetings the Twins scored early only to lose the game. The Yankees jumped out in this one and never looked back. The built up a 5-0 lead by the fourth, which was more then enough to secure the series victory. It was the Yankees’ ninth straight postseason win against the Twins. In his first playoff start Phil Hughes starred. He had pitched 12 postseason innings previously, but all in relief. In 2007 he came on in relief of Roger Clemens, who left the game with an injury in the third inning. Hughes pitched 3.2 scoreless innings, striking out four and holding down the Indians while the Yankees took the lead. Last season he pitched in all three rounds, but ended up allowing six runs in 6.1 innings. Last night he’d eclipse his 2009 postseason innings total. Hughes faced 25 batters through seven innings, using 99 pitches to dispatch 21 Twins. Only five opponents reached base on him, four on singles and one via a walk. The first one who reached, Denard Span in the fourth, was immediately erased on a double play. That came off the bat of Orlando Hudson, and was the biggest out of the game, -9 percent WPA. After that the Yankees broke open the game, and Hughes never again pitched with a WE of under 90 percent. The only remotely interesting situation after the fifth came in the top of the eighth. Kerry Wood, working for the third time in the series, started by allowing a double to Danny Valencia. Two batters later Span moved him to third with a single, and then Hudson singled him home. But with five more runs to make up and just five outs with which to score them, that barely put a dent in the WE. It got as low as 93.3 percent when Wood walked Joe Mauer, but was quickly back up over 99 percent when Boone Logan and David Robertson induced fly outs to end the inning. Only one play in this game produced a WPA of over 10 percent. That was Marcus Thames’s home run to right-center in the fifth inning. That gave the Yankees a 4-0 lead. Thames hit 12 home runs in the regular season, none of them to the opposite field. In fact, only three of them were even to left-center (though our splits classify one as center field). With the win the Yankees are the first team in the League Championship Series. They’ll wait until Friday, when they’ll travel to either St. Petersburg or Arlington for the start of a best-of-seven series. We hoped you liked reading ALDS Game Three Review: Yankees by Joe Pawlikowski! For the love of God, will someone else PLEASE win the AL Central next year? This Twins team, with their mediocre pitch-to-contact staff, can’t be anyone. Boring. hey they were a good team. they have 3 or 4 good pitchers and liriano is pretty much an ace. their lineup is nothing to sneeze at either. the yanks just got stand out pitching from everyone but sabathia (that won’t last), and their lineup was in overdrive. sabathia allowed 3 earned runs in 6 innings, pettitte allowed 2 in 7 and hughes pitched 7 scoreless. it’s hard to beat this lineup when they pitch like that, no matter who the yanks play. Let us play someone other than the Yankees first, then we can talk. Ah, those pesky playoffs. Always making the Twins play good teams. In the times that the Twins have not won the AL central since 2000 (2000, 01, 05, 07, and 08) only the 05 White Soxs have won it all and only the 07 Indians make it as far as the ALCS. And in the time that the Twins DID make it to the ALCS (2002) they were out-dueled by the Angels whom advanced 4-1. It seems to me that the teams that they’ve faced over the years (mostly Yankees) are just that much better (statistically and with better conversion of opportunities) then the Twins. The real Achilles for the Twins is the Wild Card. Since 2000 an Eastern division team has won the Wild Card 7 times (NYY twice and BOS five) which has meant that the east by rule has had to face the central (nominally Yankees vs. Twins) which results in their early departure. This year unfortunately the Yankees were ALSO the wild card (a double whammy). This speaks to perhaps a case study for either playoff reformatting or a different structure for qualifying playoff teams to face each other (division or otherwise).